It is my belief that if you get in the habit of positively reinforcing your dementia patient, praising them, and coming to each situation with great emotion you will find that they are capable of more than you can imagine. 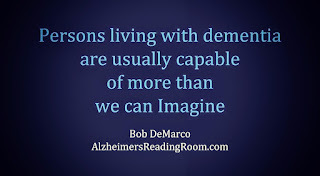 Previously I wrote, 2 Alzheimer's Tips That Worked with Dotty, and in that article I alluded to my simple belief that Alzheimer's and dementia patients are capable of more than we can imagine. When I say this I mean, we the caregivers are constrained by our own brains; and as a result, we often try to do things for dementia patients that they can do for themselves. In addition, we often avoid engaging in certain activities or we often dumb down situations because we think that dementia patients are limited in their capacity to do. Dotty taught me over and over that she was capable of more than I could ever imagine. I use the word ever above because, even though I knew for years that Dotty was capable of doing "more", every time she did more I was surprised. It just seemed that no matter how much I believed in Dotty the outcome was the same over and over, she could do more than I could imagine. No matter how hard I tried to remember that Dotty could do more, I couldn't do it, and sure enough I would be telling everyone that would listen that Dotty just did something I couldn't believe. She did more than I could imagine. Let me clear this up. I am not saying Dotty could do everything. She was certainly constrained in her ability to do many things by both her age, and by the deterioration caused by Alzheimer's in her brain. Topic - Did You Know Dementia Patients Get Agitated When Left Alone? For example, she could no longer cook on the stove. I started doing all the cooking and Dotty forgot how to do it. On the other hand, she could go into the gym and workout on the exercise machines. Shoulder pulls, chest pulls, legs, you name it. Dotty had never been in a gym in her life before Alzheimer's. I was the one that decided to take her to the gym. But Dotty was the one that first jumped on an exercise machine, and then taught me she could work out on the machines. She could do the exercises correctly. Prior to Dotty jumping on an exercise machine I had "dumbed down" what she was doing in the gym. It was me who was constraining Dotty. My brain was the culprit. It was my inability to imagine -- that often constrained us. There were other examples of my inability to fully comprehend that Dotty could in fact do it. Take Walmart as an example. We reached the point were Dotty could no longer walk around the store with me even if she was holding on to the cart. Walmart is just too big. So I tried to convince Dotty to get in and drive one of those motorized shopping carts. She refused over and over and over. She said -- NO! Finally, one day after about a year I finally got my mojo just lets do it attitude on. I went into Walmart and drove one of those carts out of the store, into the parking lot, and right up next to the door of our car. I opened the car door, stuck out my hand while Dotty asked me what we were doing, and gently guided Dotty into the seat of the cart. I didn't ask Dotty a single question. I didn't giver her a chance to say No. Instead I became a guide that day. Good guides lead with their hand and a smile, and say as few words as possible. Every time Dotty drove the cart at Walmart I gave her enormous positive reinforcement. I didn't have to try, the reinforcement just came flowing out of me. I told anyone who we met, or who would listen, that Dotty drove the Walmart cart and she drove it like a champion. I told people on the phone. The praise just continued to flow out of me everytime Dotty did it - for years. One night while Dotty was talking on the phone to Joanne she asked me, what did we do today? I said, we went to Walmart and you drove the cart. Dotty immediately smiled and then started to tell Joanne how she drove the cart so wonderfully well. At one point she looked at me and said/asked, "I'm really good at driving the cart aren't I"? Sometimes Alzheimer's patients can remember things if their is great emotion attached to the memory. Dotty's response told me that positive reinforcement works with dementia patients, and does in fact raise their self esteem. I answered yes, and felt the joy that arrives when an Alzheimer's patient smiles and expresses emotion. It is my belief that if you get in the habit of positively reinforcing your dementia patient, praising them, and coming to each situation with great emotion you will find that they are full of life. To be honest, it is up to you to do it. If you won't who will. *** Belief something one accepts as true or real; a firmly held opinion or conviction. *** Positive reinforcement is a powerful tool to help shape and change behavior. Positive reinforcement is most effective when it occurs along with the behavior or immediately after a behavior.